“Content is king” is a generally accepted truth for those of us who produce digital media. But once you have compelling content, how to best present it to your audience becomes the next challenge. In recent years, Web innovators started emphasizing the effectiveness of “digital storytelling,” or content focused on individual, human experiences using compelling and engaging formats to convey information. At the Department of State’s, Bureau of Educational and Cultural Affairs, we recently tried our hand at executing a digital storytelling effort employing rarely-used-in-government techniques to tell a story about cultural heritage, partnership, teamwork, and preservation. 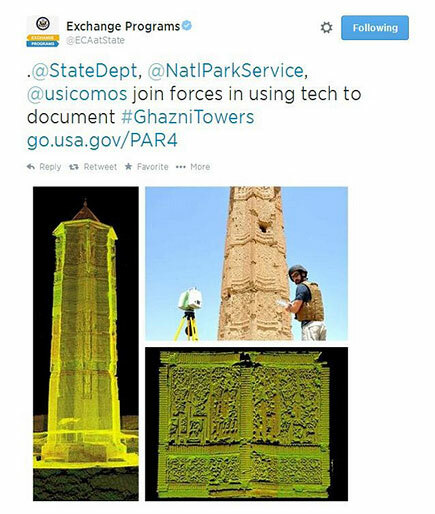 This venture resulted in the Towers of Victory: Ghazni Towers Documentation Project virtual exhibit, a multimedia-rich and interactive digital feature that communicates how several U.S. government entities came together to document an important part of world history in Afghanistan using high-tech laser scanning techniques and a lot of collaboration. Once you’ve identified your story, identifying your audience is the first step in the process of creating compelling online content. Defining your audience can be a bit tricky. The most common answer we hear to the “who is your audience” question is: Everyone! But the more you can target those interested in your content, the more you can tailor it to them. In our case, we honed our content for cultural preservationists, those in the architectural field, and history buffs while maintaining accessibility for the general public. Achieving that balance for this piece proved challenging. 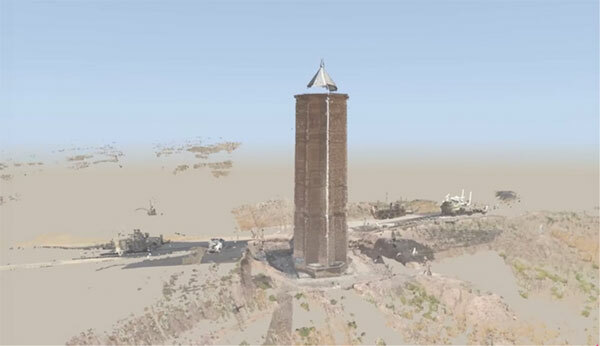 We wanted to describe the project’s advanced laser scanning techniques in detail and showcase the high-tech and innovative processes, but also wanted to present the information as a story, rather than having it read like a document. In our case, we decided to provide the user with multiple ways to digest the content: text, videos, slideshows, a timeline, aerial views of the tower, and a map. Depending on the user’s preference, members of our audience can use any one (or all) of these components to learn about the project and the team. Who do you want to take action? Who will amplify your message? Look to the wider Web and the private sector for inspiration. In our case, the New York Times’ award-winning Snowfall: The Avalanche at Tunnel Creek digital feature provided an inspiring, visually stunning, and multimedia-rich example of online storytelling. Having the various elements of your story at your fingertips will help you decide how best to present your information. Take a look at your inventory and decide which items can bring a human element to your piece. subject matter experts, a video producer, Web producer, a developer and a supportive supervisor with a vision and drive to make this happen! Based on our inventory, our audience and the story we wanted to tell, we decided to break the information into the following storytelling components. Informative text: We used the text to convey the facts, details, and overarching theme. For users who just want the information quickly, we included easy-to-scan “Fast Facts” with short bits of history and facts about the towers. For those who wanted to delve deeper, we included a Further Reading list to document our sources and provide more information. Video: Each 60-second video clip features an interview with the architects about their experience documenting the towers in their own words. Highlighting some of the personal challenges they overcame in the field (like wearing body armor in temperatures hot enough to fry their laptops!) from a first-hand account adds a human element to the story and the overall exhibit. Personal stories: We featured first-person narratives from the architectural interns who turned the laser-scans into architectural line drawings. The interns’ stories highlighted their professional experience and as well as their cultural exchange and added a personal element to the facts and process. We also highlighted the teamwork and government partnerships that helped make the documentation happen. History and interactive timeline: Beyond the fascinating technology and riveting stories included in the Ghazni Towers documentation project, placing the activity in the context of the towers’ history helped answer the “why” question regarding the importance of the government to do this work. We chose to highlight the Towers’ historical significance with an interactive timeline that starts at 559 B.C. and ends (for now) with Ghazni being named the 2013 Asian Capital of Islamic Culture and Civilization. 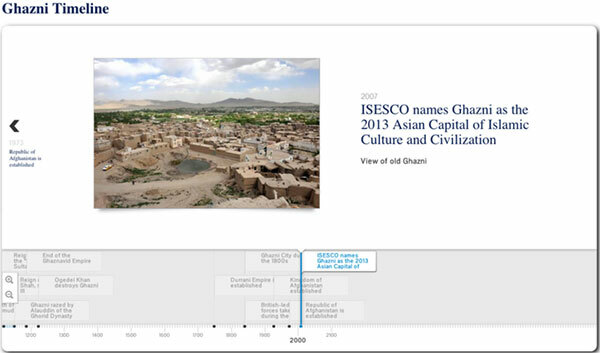 Users can scroll through history to see timeline events, paired with photos wherever possible. Visual Media: We aimed to provide as many visual examples of the work detailed in the story. The towers’ intricate inscriptions and design made for unique visual content through an aerial view of the towers (using a video), slideshows, high resolution photos, and a map of Afghanistan. However, a strong content strategy that identifies the best use of your content elements from the beginning helps you make the case against adding unnecessary or unrelated content. Remember your target audience and proceed with their needs and wants in mind to create the most effective, and shareable, online content. While we modeled our Ghazni Towers Documentation Project digital feature after a beautiful and innovative design used in the private sector, we recognize our fellow government professionals—and their often lagging technology—make up at least part of our audience. Thus, we had to ensure our timelines, parallax scrolling, and looping video could perform on older browsers and systems commonly found in the government workspace. On the other end of the tech spectrum, mobile users make up an ever-growing percentage of Web users and we didn’t want to leave them out either. By communicating our requirements and specifications to our developer early in the process, we were able to make the feature responsive and compatible with mobile platforms as well as old and new browsers. Following 508 standards guarantees that you’re not unfairly limiting your audience. Once you’ve created your final product, it’s time to let the world know about it! A coordinated promotional campaign can make all the difference. Collaborate with your press and social media teams to boost your storytelling capacity and grow your audience at the same time. Just as you identified your audience at the beginning of the process, identify your partners, advocates, fans, and anyone else who will amplify your message once it’s complete. Our team often creates social media toolkits that include graphics, sample social media messages, and key points partners such as embassies, grantees, and other online advocates can reference to best share our content. On the backend, be sure to tweak your metadata so that your content shares well in social media. For example, we customized the auto-shared social media messages (when users click on our share icons embedded on our Web feature) by using Facebook open graph data and Twitter cards. Preparing the Twitter card required an extra URL-validation step after the site was live, but the validation process was simple, and the validation approval took about 24 hours. Measuring your success (or failure) marks the final, and arguably most important, step in any online storytelling venture. Whether you created a coordinated promotional campaign or just shared with your audience, you’ll want to know which outreach efforts created the most bang for your buck. Thanks to the Digital Analytics Program, government websites use Google Analytics as the go-to metrics tool. Tallying up sessions, users, and pageviews makes a great first start, but we recommend taking your metrics further to fully measure your impact. With GA’s goal, flow, and funnel tools, you easily can see which sources brought people that not only looked at your site, but also how they interacted with your content, giving great insight into the value of each promotional source. For example, which do you find more valuable: thousands of people who come from social media source who, A) leave immediately, or hundreds who visit from social media source who, B) watch the videos, download PDFs, share your content, and visit other pages on your site? How successfully did your hashtag thread together an online conversation about your content? Which videos got the most views in relation to how they were promoted through social media? Did tagging partners and collaborators through Facebook posts and tweets ensure more sharing of your content? The answers to these questions provide you with valuable information for your next campaign. High engagement sources will vary of course, depending on your content, but you can glean some helpful insights from your experience going forward. Digital storytelling creates exciting opportunities to communicate your message with multimedia tools and craft your content with the end-user experience in mind. While this process proved challenging and long (about a year start-to-finish, overcoming typical government challenges like changing team members, balancing workloads, maternity leave, long clearance processes, and even the government shutdown), the positive reception from stakeholders and the public made it well worth the effort.